Written by Enrique Garibay, International Business Management Diploma student, originally from Mexico. On Sunday May 6th, 2018, I participated in the Vancouver Marathon as a volunteer. After sharing a picture of the water station at the event, Duni Bayona, Marketing and Communications Assistant at Greystone College (GSC) invited me to write this article for the GSC blog to share my experience. The tradition of the Vancouver Marathon goes back to 1972. This year’s run was held on Sunday May 6th, 2018. The marathon started at 8:30 AM at its start line – Queen Elizabeth Park Midlothian Avenue. The finish line was on West Pender Street, between Bute Street & Thurlow Street. Ranked as one of the top destination marathons in the world, and the scenic Boston Qualifier, it takes runners on a 42.2KM (26.2 miles) challenge. The Vancouver Marathon is a significant physical journey on foot, over an exhausting and prolonged period of time. But, most importantly, you can achieve your goals with the whole city behind you. After being invited to run the marathon or to participate as a volunteer, I decided to participate as a volunteer at one of the water stations – the Down Syndrome Research Foundation (DSRF) water station. They participate to celebrate the incredible potential of individuals with Down syndrome and help them raise funds for educational programs and services for their students – like my lovely grandson Isaac, who is 6 years old. Isaac is the reason why I chose the DSRF water station. 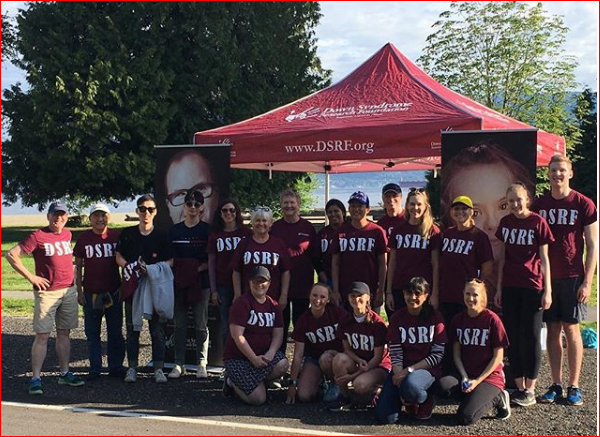 Our water station was the #F11, located on Northwest Marine Drive (after Spanish Banks East Beach Cafe / before Tolmie), between the 22-23KM mark, sponsored by the DSRF. From 7:30 AM to 1 PM, the team and I were setting up tents and tables, supporting and cheering on marathoners, providing them with water and/or electrolyte drinks and preparing energy drinks before the runners reached the station. A manual with our duties, a location map, and a video training were provided by the organizers several weeks before the race. Once all the volunteers arrived, we went over all duties and the station was set up on time. This experience was totally different compared to other experiences before when I’ve participated in other marathons – as a runner. As a volunteer, my main responsibility was to provide water to participants as they ran through the course. I also guided the runners as they passed by the water station in order to ensure a seamless movement of all participants – encouraging them to continue the race, to let them know they looked great and that they were doing amazingly. I really enjoyed my time volunteering at the Vancouver Marathon, especially when the Latin American runners arrived at our station and I encouraged them in Spanish. However, the most emotional moment came when I saw the Mexican runners approaching. It felt amazing. I encouraged them with some words in Mexican jargon, always closing my phrases with a “Just do it Paisano!” (*) The feeling I had when they turned their heads and smiled at me with their thumb up was priceless. Finally, I strongly recommend that you participate in these kinds of events. It is an amazing and unforgettable experience. I hope to be in Vancouver in 2019 and participate again but most of all, hope to be on the other side – as a runner! My thankfulness to Ema Gnipova and Barbara Portela Valverde, my dear GSC’s classmates for their kind review, edit and contributions to this article. (*) Paisano: A person from the same country.